This rare earth metal has a bright silver luster. Its characteristics can be greatly affected by even the slightest impurities. It was first identified in Paris, but was not isolated in relatively pure form until nearly 70 years later. 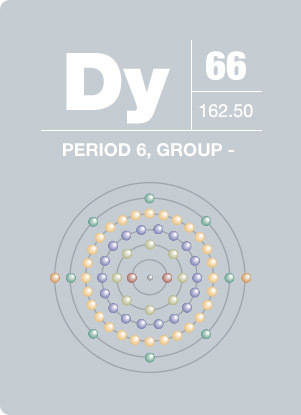 Dysprosium is never encountered as a free element, but is found in several different minerals. Although its usefulness is limited by its high readiness to oxidize, dysprosium is often used with other elements in making laser materials and nuclear reactors and is useful in the manufacture of compact discs.